Founded in 1899 by Lewis Hancock, former mayor of Austin from 1895-1897, the Hancock Golf Course stands today as one of the oldest golf courses in the state of Texas. Although the course was re-named after Mr. Hancock in 1946, it was the original site of the Austin Country Club. At one time, the course maintained sand greens and 18 holes. Today, Hancock Golf Course is located in the heart of Austin. This par 35, 9-hole course carries up and down hills over beautiful Waller Creek. The old course is relatively short by modern standards, featuring small, well-manicured greens typical of the era in which it was built. Effective January 2018, Hancock Golf Course will be a pay station operation Monday thru Thursday, walking only. Pay Station green fee is good for play all day. 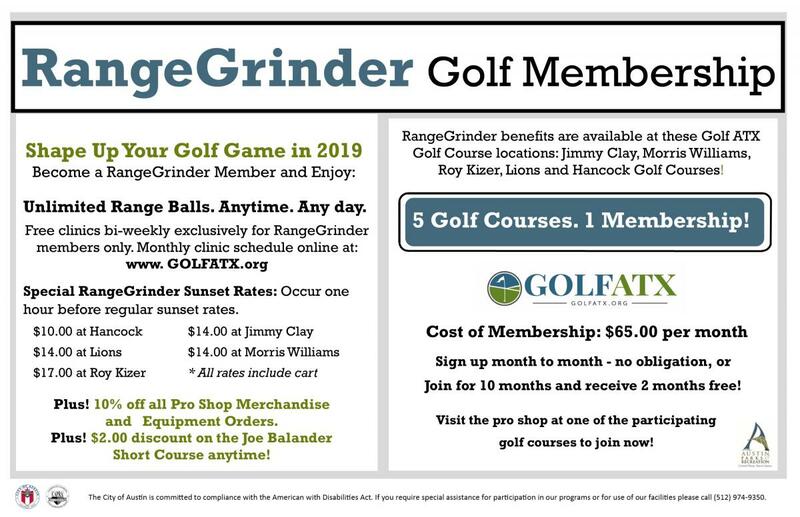 Resident and RangeGrinder cardholder discount applies only Friday thru Sunday and on holidays. Pay station accepts credit cards only. Golf patrons will pay the appropriate green fee at the pay station and must retain their stub at all times. The order of play from the first tee will be on a first-come, first-served basis. All play must start on the first hole. Normal golf operations and pro shop services will continue Friday thru Sunday and on holidays. Reservations are taken for Friday-Sunday starting at 7:00 am in person or by phone at (512) 978-2330 one day in advance, except for Sunday reservations which may be made on the Friday before. Tee times are not required, however, reservations will be accepted for groups of four. For additional information regarding reservations, please call the pro shop or 512-974-9350. For course fees Friday-Sunday and holidays, CLICK HERE. Dates Closed for Aerifying: April 15th, June 17th, Aug. 28th. Course will reopen the following day at 12 noon. Dates Closed for Overseeding: Monday, October 14th. Reopening Tuesday, October 15th at 12 noon. Payment accepted: Cash or credit cards are accepted in the pro shop Friday-Sunday and on holidays. Pay station accepts credit cards only.